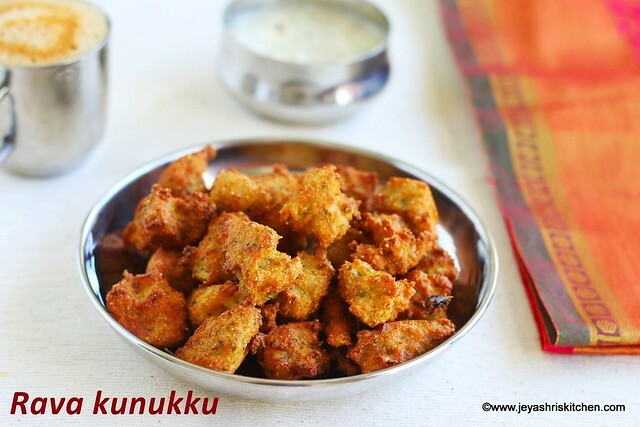 Rava kunukku is a deep fried snack recipe made with sooji as the main ingredient. We generally make kunukku with adai maavu. Recently when we visited a friend's house for evening coffee, she made this rava kunukku and served along with coffee. It tasted very nice and immediately i asked her for the recipe, but as usual forgot later. Few days back i messaged her again and asked her for the recipe. She was sweet enough to send a voice note over phone and i tried it today. The rava kunukku tasted the same and we enjoyed with coconut getti chutney and filter coffee. Generally kunukku and coconut chutney pairs very well. Even you can have this kunukku without any accompaniments. Preparation Time : 10 mins + 30 mins resting time | Cooking Time : 15 Mins |Serves: 30 pieces approx. In a wide bowl add the rava and thick yogurt and mix well. Keep it aside for 30 minutes. No need to keep it inside the refrigerator. Soak the cashew nuts in warm water. After 30 minutes, grind the cashew nuts(drain the water), ginger, green chili, coriander leaves, curry leaves and mint leaves. Grind this into a coarse paste. Just pulse it 2-3 times in the mixie. Add this coarse paste to the rava mixture. When it is hot, bring down to medium flame and take small portions of the batter and drop it into the oil. Deep fry till golden brown. Take it out from oil and drain in a kitchen towel. 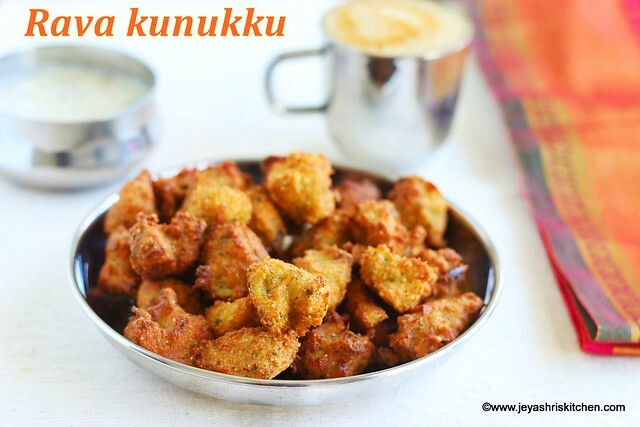 Serve this hot crispy rava kunukku with getti chutney and filter coffee. Add this coarse paste to the rava mixture. Add the coconut bits. You can add finely chopped onions to the batter if you want. Ensure that the batter is not too thick, else the kunukkus will be too hard. You can store the remaining rava kunukku batter in the refrigerator and use up next day. The rava kunukkus stay nice even after 2 hours, so if you are planning for navaratri snacks, you can make this for your guests in advance.